Mark's Tickets is the best place to find tickets for St. Louis Cardinals fans. Just check this page for any new events or schedule updates throughout the year. We sell tickets to every St. Louis Cardinals game around the world. 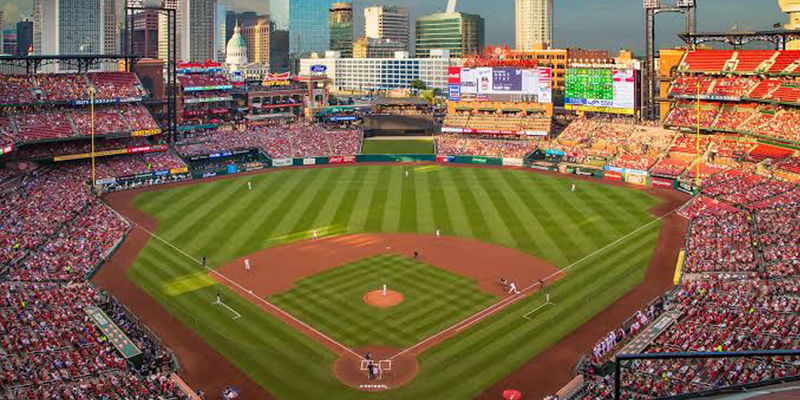 We know how passionate St. Louis Cardinals fans can be about baseball, so we make sure to have hundreds of tickets for every game available right up until it starts. For those looking for cheap St. Louis Cardinals tickets, we offer tickets starting at very low prices (many times below face value). We offer tickets in most sections of every venue that you can see St. Louis Cardinals. Simply choose the city or venue that you are interested in below, and you will be able to see all of the available seats. Do not forget that Marks Tickets also specializes in sold out St. Louis Cardinals tickets. No longer will sold out shows prevent you from seeing St. Louis Cardinals. The St. Louis Cardinals are a professional baseball team that plays in the MLB. The Cardinals play their home games at Busch Stadium in St. Louis, Missouri. With 162 games per year, and 81 being home games, The St. Louis Cardinals, a professional baseball team based in St. Louis, Missouri, compete in the National League (NL) Central Division of Major League Baseball (MLB). Busch Stadium has served as their home field since 2006. The Cardinals' roots commence from an earlier local team from whom they took their original name, Brown Stockings. St. Louis established themselves in 1882 as a charter American Association (AA) team, shortened their name to "Browns" the next season, then joined the NL in 1892. They were also known as the "Perfectos" before adopting Cardinals as their official name in 1900. As one of the most decorated and successful franchises in MLB history, St. Louis has won eleven World Series championships, 18 National League pennants, and 10 division titles. Their 11 World Series titles are second only to the New York Yankees' 27. In the AA, St. Louis dominated with four league championships and tied one pre-World Series championship with, and, took another against, the Chicago White Stockings (now the Chicago Cubs) of the NL. Other notable achievements include Branch Rickey's pioneering of the farm system, Rogers Hornsby's two Triple Crowns, Stan Musial's 17 Major League and 29 NL records, Bob Gibson's 1.12 ERA season, Whitey Herzog's Whiteyball, Mark McGwire's home run chase, and the 2011 championship team's unprecedented comebacks. Four times in their history St. Louis has won 105 or more games and won 100 or more a total of eight times. Cardinals players have won 20 league MVPs, four batting Triple Crowns, and three Cy Young Awards. Baseball Hall of Fame inductees include Lou Brock, Dizzy Dean, Gibson, Herzog, Hornsby, Joe Medwick, Musial, Rickey, Red Schoendienst, Ozzie Smith, and Bruce Sutter. Their historic rivalry with the Cubs is one of the most storied in professional sports. An investment group headed by William DeWitt, Jr. owns the Cardinals, who is the chairman and managing partner. John Mozeliak is the general manager and Mike Matheny is the manager. Renowned for strong support from fans despite being in one of the sport's middle markets, the Cardinals routinely see attendances among the league's highest, and are consistently among the top three in MLB in local television ratings. As of 2013, Forbes valued the Cardinals at $716 million, making them the tenth-most valuable franchise in MLB "in the best single-team baseball market" in the United States.